TORONTO, Aug. 30, 2018 /CNW/ – On Monday, August 20th Pizza Nova opened its doors to a new location on 714 Queen St. East. at Broadview Ave. in Toronto. To help celebrate the grand opening and share our spirit of community, Pizza Nova served small cheese or pepperoni pizza for only $2.00 tax included from 11am – 8pm with all proceeds from every pizza sold being donated to St. John the Compassionate Mission, a local mission steps away from the new Pizza Nova location on Queen St.
On Wednesday, August 29th, Pizza Nova, presented St. John the Compassionate Mission with the proceeds at an official cheque presentation ceremony. Through the support and generosity of the community, the money donated to St. John the Compassionate Mission wouldn’t have been possible without the thousands of Riverside residents and passers-by who came out on August 20th to join in the celebrations of the grand opening and purchased a small pepperoni or cheese pizza for only $2.00. The ever charming Pizza Nova mascot, Leonardough interacted with fans capturing the moment with photos, while children enjoyed having their faces painted, and animal balloons. 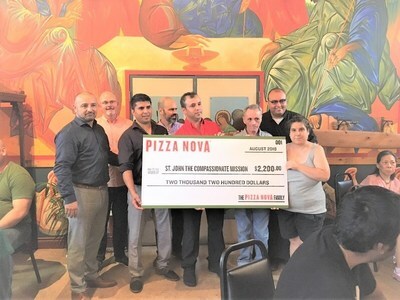 Thank you to the community of Riverside in Toronto for helping us celebrate our new Pizza Nova location on Queen St. and supporting St. John the Compassionate Mission! For 55 years, Pizza Nova has been making authentic Italian Pizzas using only the highest quality and freshest ingredients. Pizza Nova is the first pizza company in Canada to bring you Pepperoni, Chicken, and Beef raised without the use of antibiotics and hormones. It’s all about ingredients at Pizza Nova. Panzerottis, Lasagna, Potato Wedges, Focaccia Barese and More! Visit our newest Pizza Nova in Toronto at 714 Queen St. East at Broadview Ave., where we look forward to serving you authentic Italian taste with the freshest ingredients! There is something for everyone at Pizza Nova. Founded in 1963, Toronto-based Pizza Nova is a family-operated business and has over 140 locations in Southern Ontario. Lauded for their community work, they specialize in fresh toppings, and offer a wide range of menu items including salads, lasagna, panzerotti, Italian sandwiches, chicken wings, FOCACCIA BARESE™ and a specialty line of Primucci Branded Products featuring Italian Peeled Tomatoes, Extra Virgin Olive Oil, Homestyle Tomato Sauce, Italian Hot Peppers, Spicy Green Olives and Sundried Black Olives. Pizza Nova locations offer delivery, pickup, online ordering and some sit-down service. Visit www.pizzanova.com.